Wes brought his Canadian fishing skills to the Muskegon river on a group trip and got this nice male Steelhead. The Muskegon river fall and early winter steelhead run is in progress now and will be going through December and into the New Year. 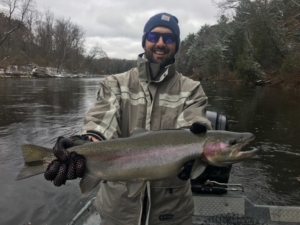 Fishing has been spotty at times, with steelhead in the entire Muskegon river “system”, from Croton dam down to Muskegon itself, but there is little to no concentration of steelhead in any given stretch. With both fly fishing and light spin tackle equipment, we’re fishing various types of water, it’s all about “fishing smarter, not harder” and effectively covering as much water as possible in the process. We’re also catching the occasional resident Brown or Rainbow trout and there are some lake run Brown trout coming in as well. With pretty good rains a week+ ago, the river came up, we had visions of a big push of steelhead fresh out of lake Michigan, but that did not happen, instead we’re seeing a trickle affect of new fish coming it. The higher water levels we DID have were very short lived, with peak water levels lasting less than 24 hours and then they began to drop and the river is once again very clear and lower than we would like to see. Click HERE for current river conditions and flow data. With early winter having set in, it looks like we’ll be hunting for steelhead up and down the entire system from Croton to Muskegon for the remainder of the “season”. Click HERE for up to date weather information. All this being said, there are some rather large steelhead swimming about this year and even though one might not have a banner day of a bunch of hook ups and battles, the potential is there to hook a fish of a lifetime ! Present water temperature on the Muskegon river is in the 44-45 degree range in and around the Newaygo area.